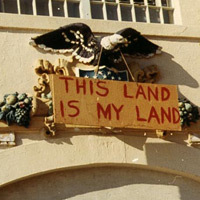 In 1969, a group of Native activists occupied Alcatraz island. Their actions set off a wave of direct action that continues to the present day. One year ago today, President Trump signed an executive order fast-tracking construction of the Dakota Access Pipeline. The pipeline now pumps up to half a million barrels of oil each day beneath Lake Oahe on the lands of the Lakota people. The Lakota fought this project for years, filing lawsuits and leading actions to protect their water from being contaminated with oil. Thousands flocked to the prayer camps at Standing Rock, moving the Obama administration to halt construction. The win proved ephemeral, with Trump reversing the decision and allowing construction to proceed. Still, Standing Rock awakened many in the United States to the ongoing struggles of indigenous people. What most of them may not have realized was that this was not the first time Natives made themselves heard by reclaiming land. Before Standing Rock, there was Alcatraz. In the 1960s, Natives were moving to cities in large numbers, as federal relocation programs sought to assimilate them into mainstream, white-dominated culture. At the time, U.S. policy toward Indians centered on the goal of “termination”: ending the special status of indigenous peoples by withdrawing aid, services, and protections. More than 100 tribes lost federal recognition, and 2.5 million acres of Native land were confiscated, plunging many nations further into poverty. As indigenous people came together in cities, their common hardships served as a basis for intertribal solidarity. Native activists grew their hair long and embraced ancestral traditions, forging a radicalism inspired by the Black Power movement. The American Indian Movement, founded in 1968 and modeled after the Black Panthers, championed “Red Power” and participated in Fred Hampton’s Rainbow Coalition. Then, in late October 1969, the San Francisco Indian Center—a hub for thousands of Indians living in the Bay Area, providing meeting space and social services—burned down. In its ashes, indigenous leaders saw a chance to assert their need for land and sovereignty. Eighty-nine activists, many of them students, boarded boats on the San Francisco Bay and sailed for Alcatraz Island, the site of a federal prison that had recently been decommissioned. Rowing past armed boats and helicopters, fourteen people made landfall and set up camp. Though the Coast Guard initially blockaded the island, tenacious supporters delivered supplies by canoe. The conditions on the island—there was neither running water nor electricity—were reminiscent of those on many reservations. 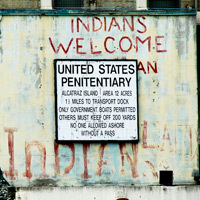 The camp became a bustling village as hundreds of Natives converged on Alcatraz. 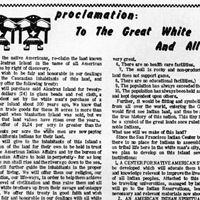 United as “Indians of All Tribes,” they published a proclamation declaring their intention to build a cultural center and school on the island. They offered to purchase it from the federal government for $24 in beads and cloth (“more than was paid when Manhattan Island was sold”). Spokesman John Trudell denounced termination over the pirate airwaves of Radio Free Alcatraz, while others shot at passing boats with toy bows and arrows, highlighting just how comically futile an armed struggle over Alcatraz would have been. The media was quick to spotlight leaders like Richard Oakes and other men who fit the trope of the “Indian warrior.” But women were essential to the movement. LaNada Means, a Shoshone Bannock student at UC Berkeley, was part of the initial landing party and was recently described by fellow occupier Dean Chavers as “the real leader of the occupation.” Grace Thorpe of the Sac and Fox Nation recruited celebrities like Jane Fonda and Marlon Brando to visit the island and show their support. A Lakota/Colville nurse named Stella Leach ran the health clinic, while other women oversaw the community kitchen and school. As the occupation drew wider notice, the federal government was spurred to respond. President Nixon sent a surrogate, whose offer to build a park for the Natives was swiftly rebuffed; Means asserted that they wanted complete control of the island, and a $500,000 grant to renovate it. Some of Nixon’s advisors were sympathetic to the Native cause, including Vice President Spiro Agnew, who urged the President to disavow termination “in the most forceful way possible.” In July 1970, eight months into the occupation, Nixon stood before Congress to herald the dawn of “a new era, in which the Indian future is determined by Indian acts and Indian decisions.” He did not mention Alcatraz by name, but the impetus for his “special message” to Congress was clear. And thus, termination gave way to self-determination. Congress did not take long to translate Nixon’s message into law. By the end of 1970, a White House–endorsed bill returned 48,000 acres around the sacred Blue Lake to Taos Pueblo in New Mexico. In 1971, a Settlement Act transferred 40 million acres and $1 billion to Alaska Natives. 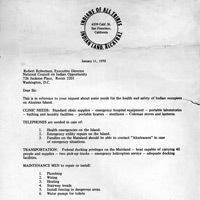 In 1972, Nixon signed an executive order returning Mt. Adams to the Yakima in Washington. Congress later passed the 1975 Indian Self-Determination Act, giving tribes increased control over federal funds and programs. Some White House aides framed the shift as an extension of Nixon’s “new federalism”; but whatever the administration’s logic, the dramatic policy changes precipitated by Alcatraz suggest a deeper message: direct action gets the goods. Never before had so many nations joined in a single undertaking. Veterans of Alcatraz went on to lead at least seventy more occupations and protests. 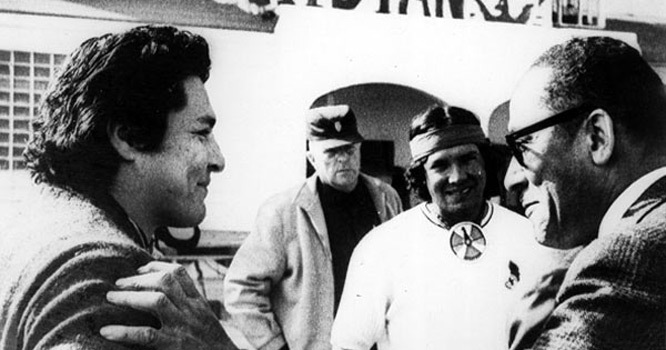 When AIM seized the Mayflower II on Thanksgiving Day, 1970, they acknowledged Alcatraz as the birthplace of a new unity among indigenous peoples. That solidarity fueled the 1972 Trail of Broken Treaties, which culminated in the takeover of the BIA headquarters. One year later, the occupation of Wounded Knee again brought national attention to the myriad injustices faced by Natives. Tactics honed at Alcatraz are still in use today. Standing Rock was perhaps a re-occupation, since it took place on federal lands promised to the Lakota by treaty. The prayer camps were supported by alliances that trace their roots to Alcatraz and other Red Power struggles. As pirate radio shaped the message of Alcatraz, water protectors today use social media to circumvent mainstream silence. Indigenous struggles are often ignored, yet smartphones, livestreams, and drones make it possible to broadcast the violent repression of Natives in real-time. When, in November 2016, police blasted Standing Rock protesters with water cannons during an overnight standoff in below-freezing temperatures, thousands watched in horror through livestream channels like Unicorn Riot, and #NoDAPL trended widely on Twitter. New technologies are revealing dynamics that have been in play for centuries. Increasingly desperate to wring resources from the earth, energy companies have renewed their assault on Native lands. By shrinking Bears Ears National Monument, Trump has opened an indigenous homeland to exploitative drilling and mining. Keystone XL, Bayou Bridge, and Mariner East 2 are just some of the pipeline projects that currently threaten indigenous communities—not to mention the global climate. Yet if the colonial impulse is still kicking, so too is the spirit of resistance. Vibrant camps haven taken to the land to protest many of these projects, and more are certain to come. As Alcatraz once sparked a movement, Standing Rock rekindled the flames. By this light, we all see more clearly. Delilah Friedler is a writer living in New Orleans, who previously wrote about Standing Rock for n+1.